With the warm weather of spring also comes graduations, family reunions, and special occasions that require the use of your beautiful outdoor space. With the warm weather of spring also comes graduations, family reunions, and special occasions that require the use of your beautiful outdoor space. For this reason, it is essential to prepare your wood deck for spring, as warmer temperatures and spring celebrations will be here before you know it! As you are shaping up your spring landscape for 2019, consider these easy ways to prepare your beautiful wood deck for spring entertaining. One of the first steps to preparing your landscape and deck for spring is tidying up your outdoor space. Before you get started with decorating, it is important to have a clean area, both on and around your deck. Remove dead or wet leaves by sweeping your deck, which will also help to free your space of dirt and debris that has built up on your deck throughout the winter. Once you have removed the leaves and dirt, it is best to rinse your deck using a high-power setting on your hose or a power washer. 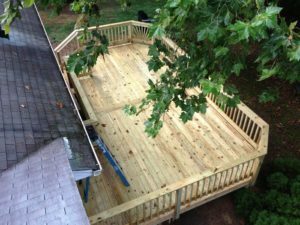 This step is an essential step of deck maintenance, as it serves to reduce the risk of mold or rot on your beautiful wood deck. While the rain may have appeared to wash away dirt from your deck furniture, it is best to give each piece of deck furniture a thorough cleaning at the start of the season. In addition to rinsing and towel-drying metal furniture, be sure to remove fabric covers and wash them before using them. This step of washing and drying your deck furniture will also help to reduce the risk of mold growth on both your deck and deck furniture. The start of the season is an excellent time to invest in practical additions to your deck. Additions such as a screened porch, a pergola, or a pagoda could be perfect for your future entertaining needs in 2019. Not only will these features add visual appeal to the look of your outdoor space, but they will also provide you and your family with functional features to enjoy on a warm day outside.